Welcome to the cleanest, most modern laundromat in Southeast, Georgia. At Suds, you’ll find plenty of Speed Queen washers and dryers in an array of sizes. You can even wash up to 125 lbs with our biggest washers – the largest in the state! *Most of our machines accept coin and even accepts credit/debit card to make paying easy. And, we always have an attendant on-site to help you! While you wait on your laundry, enjoy our many amenities including free wifi, vending machines, and flat screen TVs. Can’t wait around for your laundry yourself? Suds has a quick and easy Wash and Fold service. All you do is drop off your clothes and come back when they’re ready! 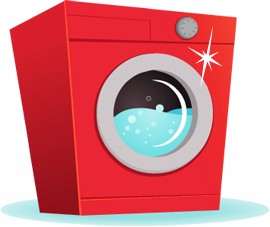 Wash and Fold service is available at all of our locations excluding Largo. *All locations except Largo Drive accept credit/debit cards.